We headed back out to face the chill and to create our totem. Next to our tree was set up all the clay making equipment needed and a tree stump length was used as a table. 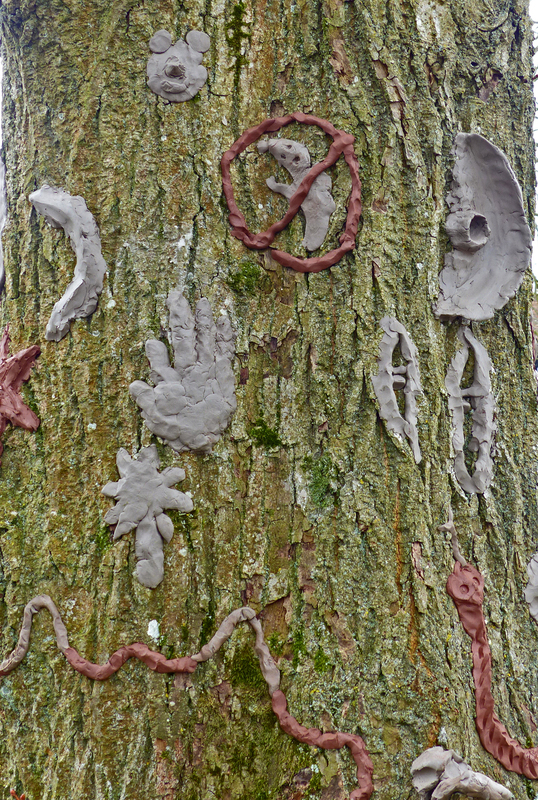 We selected our clay and started to create individual symbols of our journey. 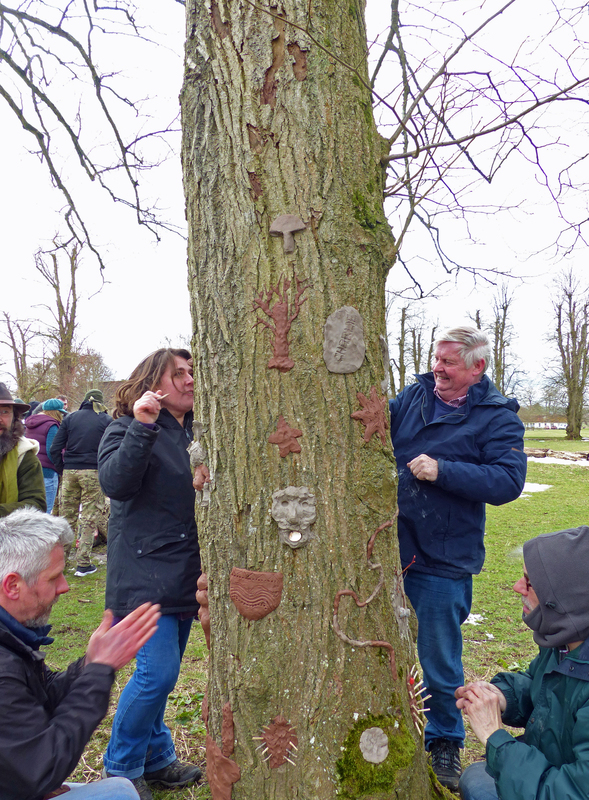 People chose different parts of the tree trunk, and soon everyone was working intently within their space. Creations started to cover the trunk, right the way around. All the while, a cold easterly wind blew at us as we worked, but it didn’t deter us from having a good laugh as we went along. A bucket of warm water had been provided to wash our hands, and as the time went on attracted group members like flies, using it to warm their hands in. Our totem took shape, covered in clay to head height. 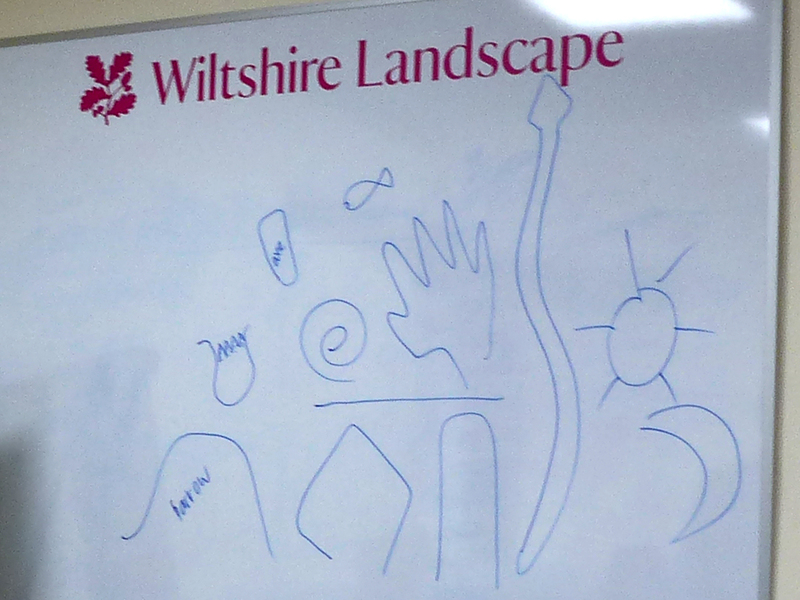 There were moons, stars, stones, snakes, hands, faces, naked figurine forms, a fairy and even a Ghostbusters logo? And there it stood, it was now complete, our collective group symbol, our group identity. We headed back into the warmth of the gallery room. We relaxed and settled down to hear some music that had been written by a group member. I was looking forward to this moment as I had already heard the two songs performed in a previous session. Overcoming her fears, she played the guitar and started to sing. Wow, what a voice and what moving and emotional lyrics. Everyone in the room was focused on the song, the words, the voice, the meaning. It was very powerful indeed. On her second song Max joined in with his flute for a harmonising duet of styles, it was perfect. Yvette also took the floor and sang a most beautifully haunting melody that awoke a deep, ancestral spirit within me. 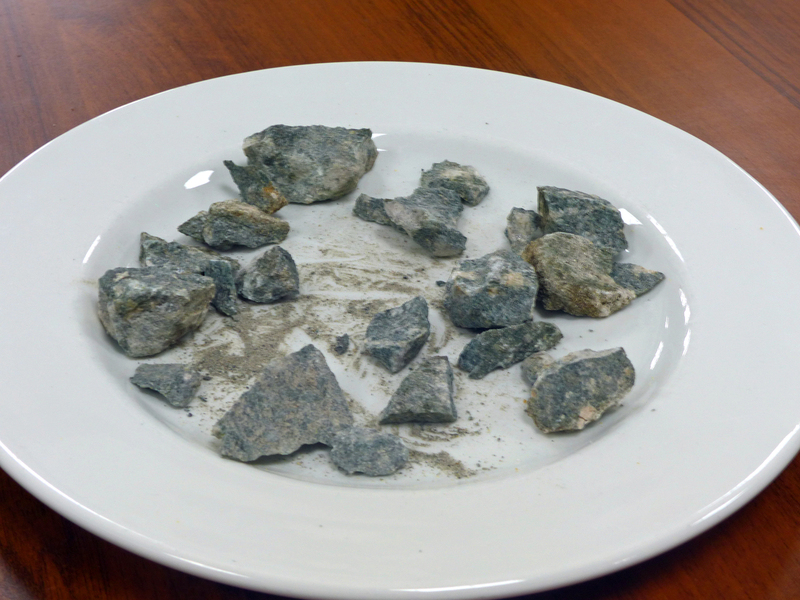 After the singing, Yvette handed round a plate of Preseli Blue stone. It was for us all to take a piece home to remember our time during Human Henge, which was a lovely thought. 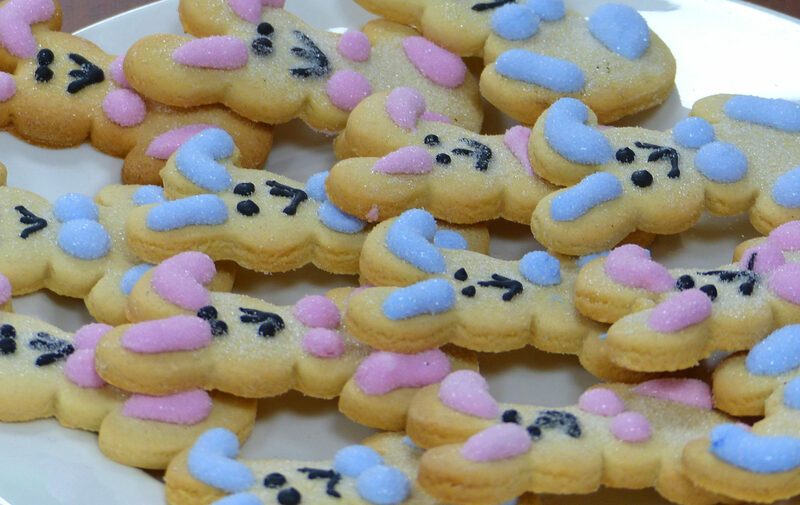 There were also some groovy Easter Bunny biscuits for all to have too. During this time, post-it notes were given out so we could write a personal message to go on a large board, I believe to be shown at the conference coming soon. As the day concluded Laura thanked all people involved and there was a large round of applause for them and all the work they had put into this project. I would like my own personal note of thanks to go to the other group members, who made this a very memorable and happy experience. Human Henge was very much a unique shared experience. A shared experience that, I hope, we all can go on sharing, together, in the future. I would also like to thank Yvette and Laura for letting me write the blog. And on behalf of myself and all group members: I would like to thank all at National Trust Avebury, Human Henge, Richmond Fellowship, Restoration Trust, Volunteer Steve, the peoples of the Neolithic period, the weather gods and lastly of course Greggs, for a very unique experience. This entry was posted in General on April 12, 2018 by Tasha Winton.